What problems does hard water cause? If you live in an area with a high level of hard water, the last thing you want to do is build a new home for it to be damaged by limescale. Hard water is known to have high levels of calcium and magnesium. While it may not be a health risk, it can cause havoc in your home. Here we tell you all about the problems hard water can cause. Why do I need to worry about hard water? There are specific parts of the UK where areas of hard water are more prominent and may affect homes significantly. If you are moving into a new area it is highly recommended that you check whether it is hard or soft water, you can take a look at Bristan’s water map to find your location. One of the first signs your drinking water has been affected by hard water will be the smell or taste. Usually, a strange odour can be smelt from the water which is a good indication you may need to look at purchasing a water conditioner. You may also experience a rather metallic taste to your water; this normally means your water has higher levels of iron. There is nothing worse than purchasing a new bathroom to have it all stained. A common problem hard water can cause is reddish or brown stains on porcelain units. While this may be rather embarrassing, it isn’t down to you being uncleanly. You will often find big streaks across your loo where an increased amount of iron sits within the hard water. This could also be an indication that your pipework may need looking at, if you are having a considerable amount of rusty water come through into your toilet it may be making its way from the pipes, so you should probably call plumbers Milton Keynes. Unfortunately, until you fix the hard water issue, you may be putting a vast amount of elbow grease into the removal process. While you may think about using a number of bathroom cleaning products one of the best home solutions is vinegar to remove the stains. Alternatively, we recommend taking a read of the Stain Expert for more information on the best ways to remove stains and have your bathroom gleaming. Everyone loves a good hot shower; it is the only part of your day where you can escape the world. Depending on how hard the water is you may find it difficult to remove soap residue from your body. If you live in a hard water area, you will notice a significant amount of limescale build up on your shower head; this can cause pressure within the unit causing leaks and burst pipes. Hard water can also take its toll on the human body, have you ever noticed a difference in the way your hair feels and looks when your shower in a hard water area compared to a soft water one. If you have travelled to another country, you will notice a considerable difference in the condition of your hair while you’re away to when you’re at home. We highly recommend getting a water conditioner if you are noticing hair loss, dullness or dryness in your hair. The calcium can collect around your hair follicles which can hinder growth and the appearance. As hard water leaves soap behind another common cause of hard water is an irritation to the skin. Due to the soap not being washed away, it can leave the skin itchy and dry. One of the most common skin conditions within these areas is eczema which is often the case for small children. If you have a new bathroom or are thinking of selling your home, then you will want to remove as much scum from the bathroom as you possibly can. In a lot of cases once you have showered in hot water due to the heat in the bathroom the water will evaporate and leave calcium deposits all over the bath, shower and walls. Unfortunately, there is not much you can do about it other than removing it or invest in a water conditioner. Soap scum is another thing you will often come across in the bathroom; this is where the minerals within the water do not agree with the soap. One thing you do need to keep an eye out for is if you have a shower curtain. If not regularly cleaned the soap deposits can lead to microbial biofilm producing which can lead to disease-spreading bacteria. Not only can soap scum affect your bathroom but also your kitchen. If your dishes are not washing correctly in the dishwasher or you are noticing spotty dishes, this could be due to hard water. As well as showers and toilets your plumbing can also clog up due to hard water. Scale deposits are more likely to build-up in your households pipework which may cause backups of water or even a leaking pipe. Don’t think it cannot happen if you have only just moved in. 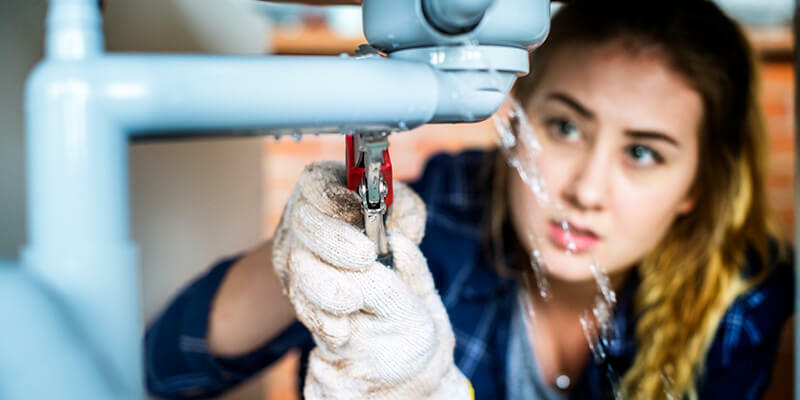 If you are in either an old or newer home it can still happen to you, so you may want to get to know plumbers Aylesbury. We previously mentioned how soap reacts with the minerals in hard water when it comes to washing your clothes it is exactly the same. Unfortunately, clothes washed in hard water are less likely going to be as clean as soap builds-up within the clothes causing them to appear dull, and in some cases greasy. It is recommended when you live in a hard water area to purchase detergent with a softner built in such as Calgon. Should I get a water conditioner? During this article, we covered the many causes hard water can have on your home. One of the best ways to minimise the problems caused by hard water is to install a water conditioner. We mentioned earlier about purchasing water softeners but think about how much money you are spending on doing so. By purchasing a water conditioner, you can have softer water all year around and will not have to worry about the products you purchase.